Chest X-rays is a painless, non-invasive test and is the most commonly preferred diagnostic examination to produce images of heart, lungs, airways, blood vessels and the bones of the spine and chest. An X-ray uses electromagnetic waves and ionizing radiation to create pictures of the inside of your body. The procedures involves positioning the body between the machine that produces the X-rays and a plate that that creates the image digitally or with X-ray film. Posterior - Anterior (PA). 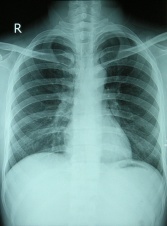 This is the most common and preferred type of chest X-Ray. Posterior - anterior refers to the direction of the X-Ray beam travel. ; i e. X-Ray beams hit the posterior part of the chest before the anterior part. To obtain the image, the patient is asked to stand with their chest against the film, to hold their arms up or to the sides and roll their shoulders forward. The X-ray technician may then ask the patient to take few deep breaths and hold it for a couple of seconds. This techniques of holding the breath generally helps to get a clear picture of the heart and lungs on the image. Anterior - posterior (AP): This type of chest X-Ray is generally less preferred because the image of the heart and mediastinum is less clear and focused in this projection. To obtain AP image, the patient is asked to stand with their back against the film. If the patient is unable to stand, an AP image can also be taken with the patient sitting or supine on the bed. 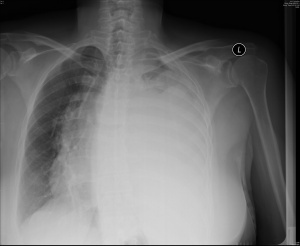 Decubitus: This type of X-Ray shows a frontal view of the chest when the patient is lying on their side(s). 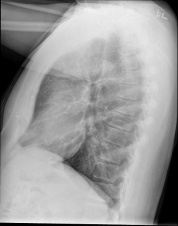 Decubitus X-Ray can be performed to assess the air inside the lung, the presence of free fluid, or airway obstruction. 2. To obtain the side-view (lateral): A lateral image is usually taken to complement the frontal view. A lateral image is useful to localise a lesion since, together with a frontal image, it allows a 3-dimensional analysis. To obtain a lateral image, the patient is asked to turn and place one shoulder on the plate and raise their hands over their head. The technician may again ask the patient to take a deep breath and hold it. Date and time of the X-Ray taken. There could be a few images taken on the same day. Patient's position. Check whether the patient is upright, semi-erect, or supine when the image was taken. R - Rotation. Check whether the patient's position is rotated. The patient is NOT rotated if the spinous processes are equidistant from the medial ends of the clavicles. I - Inspiration. Check whether the 5 - 7 anterior ribs intersect the diaphragm in the mid-clavicular line. If the intersection happens in anterior ribs 8 or more, then the lungs are hyperinflated. P - Penetration. Check whether the spine and the spaces between the ribs can be seen through the heart; which indicates that the X-ray exposure is adequate. Is there any previous films for comparison purposes? Foreign objects such as lines, tubes, pacemaker, drains, etc. Foreign objects can also be non-medical such as bullets, glass, etc. Look at the big picture. You may want to start looking at the chest x-ray from a distance and then move closer. This will allow you to look at the big picture and see major abnormalities (if any). A Airways The trachea should be central or slightly to the right. If it is deviated, check whether it is due to the patient's position or another pathological cause. B Bones and soft tissues Assess the bones visible in the image from top to bottom. The edges of the bones should be smooth, otherwise a fracture may be indicated. Also assess for bone density, oedema or metastatic lesion. C Cardiac On a PA image, the heart's width should be less than 50% of the chest width. On an AP image, it should be between 50-60% of the chest width. D Diaphragm The right diaphragm is normally higher than the left. The costophrenic and cardiophrenic angles should be clearly visible. The blunting of those angles may indicate effusion. E Edges of the Heart The edges of the heart should be clearly defined. Otherwise, there may be consolidation in the adjacent lung lobes. F Fields and Fissure Check for any absence of normal lung markings in both fields. Also check for opaque masses, consolidation, or fluid. Assess the aorta and pulmonary vessels. The aortic knob should be visible. A normal gastric bubble can be seen below the left diaphragm. H Hila The left hilum is normally higher than the right. Visible lymph nodes around the hila are an abnormal finding. Also check for masses or calcification around the hila. A study conducted by Tape and Mushlin (1988) to study the effect of routine chest x-rays of pre-operative patients at risk for postoperative disease. Patient records from 341 admissions were reviewed to determine the relationship between chest x-ray results and postoperative chest complications. Patients who had major abnormalities had a 40% postoperative complication rate, compared with 9% for those with normal x-rays; but only 13% of the complications occurred in patients with major abnormalities. Nine patients had x-ray findings that led to clinical action: three with potentially beneficial management changes (congestive heart failure in 2, fibrosis in 1) and six with potentially detrimental clinical action (false diagnosis of tuberculosis in 2, false diagnosis of nodules in 2, falsely normal chest x-ray in 2). None of 50 surgical cancellations occurred as a result of an abnormal x-ray. All the beneficial effects attributable to preoperative chest x-rays accrued to patients who had clinical evidence of chest disease. The authors conclude that routine chest x-rays were not helpful in improving patient outcomes. They recommend ordering preoperative chest x-rays based on clinical indications so that the likelihood of false positives and false negatives and their associated detrimental effects can be minimized. Comparison with other imaging method. Computed Tomography (CT) has been suggested as the gold standard of chest imaging due to its high sensitivity and specificity, However, due to its high-cost, length of procedure, and difficulty to access, CT has not replaced X-Ray as the primary chest imaging tool. A more novel diagnostic tool, Lung Ultrasound (LUS), has shown to be more practical and cheaper than CT whilst being more precise than X-Ray in producing chest images. However, more robust research needs to be done to evaluate LUS accuracy in various pathologies in order for a comparison with chest X-Ray to be accurately made. ↑ Tape TG, Mushlin AI. How useful are routine chest x-rays of preoperative patients at risk for postoperative chest disease?. Journal of general internal medicine 1988; 3.1: 15-20.